My name is Mason Boudreaux, and I played football for South Lafourche High School. I am now signed to play for Nicholls State University. I was a 4 year letterman. I made 2nd Team All-District my junior and senior year. LAFM: You signed with Nicholls. What other schools were next in line if you had to say 1-3? I was looking at McNeese and Northwestern. They were really the only other 2 schools that had my interest. LAFM: When did you first come into contact with the Colonels? Junior Day. Nicholls has a day for junior recruits. It is during their spring game. We got to meet the coaches and the team. LAFM: Why did you choose Nicholls? It was close to home, and when I went their it felt right. I just really liked the school and was comfortable. The official visit to Nicholls was probably the funnest part. I got to hang out with the players. I got to visit the whole campus and check everything out. I visited with the Head Coach (Charlie Stubbs) and the rest of the coaching staff. LAFM: Who are some people that stand out as major factors in choosing Nichols? I would say my parents and Coach Skains. Coach Skains got me noticed by multiple schools. He sent my name out and got me connected. My parents have just supported me and all my decisions. LAFM: What do you bring as a player to the Nichols football program? I am a really strong player and good blocker. I am a hard worker as well. I need to improve my speed. I am about to go run some 40’s and 100’s right now. I am really excited to start working with the team, playing football, and getting ready for the fall season. LAFM: What advice can you give to the 2015 class on their recruitment process? Stay patient. You really never know when someone is going to offer. I never heard anything for a long time from McNeese. Out of no where they got in touch with me. Peyton Guidry ( LB South Lafourche) was never contacted by Northwestern. Still, he went to their camp and then was immediately offered. 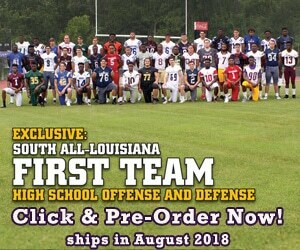 LAFM: How did South Lafourche High School prepare you for playing football at the next level? Coach Skains and the coaching staff really work us. They have a good format for practice which is similar to a college type of practice. We have coaches with college experience who prepared us as best as they could.